← Technology, Antitrust, Trade, Taxes …. Laws Need an Update? THE WTO — U.S. & QATAR — What’s the Future? The U.S. Secretary of Commerce has again spuriously attacked the WTO for the way it has reviewed U.S. antidumping and countervailing duty cases. 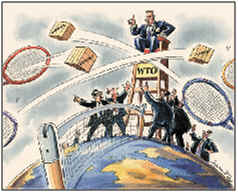 (We have lost most of our cases for years that have been reviewed by the WTO’s dispute resolution system.) Every major country has agreed that the WTO reviews were fair and our excessive reliance on trade remedy actions within the United States as protectionism. Unfortunately, the USTR is now staffed by lawyers that have litigated these ill-informed cases for decades. On the same day Wilbur Ross was again knocking the WTO, the small country of Qatar filed a broad action against the Persian Gulf states that imposed an economic boycott on it. Potentially allowing the responding states to raise the unique ‘national security defense.’ And giving the WTO not only the opportunity to rule on the national security exception for the first time but also on the use of economic boycotts in international relations under global trade law. Nothing can be more glaring than the largest economic and political power turning on its own creation and one of the smallest states turning to it to save itself. My point is who is threatening the WTO and who is relying upon it? This is a very awkward situation for the United States and the global community. The role of the U.S. and the Trump administration in global trade and diplomacy is at stake as well as the role of the WTO in protecting the global rules of conduct. That’s what is going on. We’ll see …………. …. Wilbur Ross, “Free Trade is a Two-Way Street.” Wall Street Journal (August 1, 2017). …. “Qatar Launches WTO Complaint against Economic Boycott.” Reuters (July 31, 2017). …. “Qatar Files Complaints Against Saudi Arabia, UAE and Baharain.” WTO News (August 4, 2017).